What tickles your taste buds? 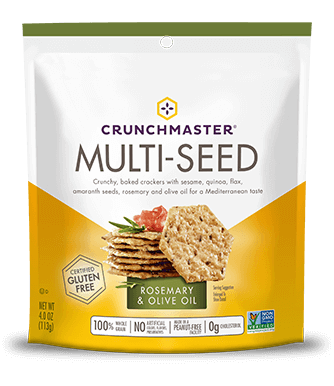 Choose from Original, Roasted Garlic, and Rosemary & Olive Oil Crunchmaster Multi-Seed Crackers. They’re specially crafted to pair with all your favorite flavors like artisan cheeses, hummus, seafood, soups and salad. 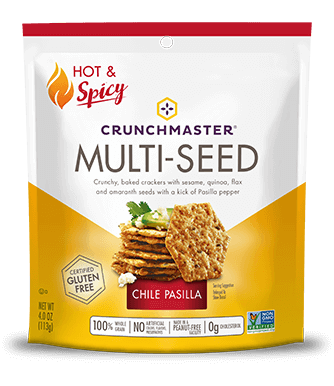 Look for them in the deli or specialty cracker section of your local supermarket. 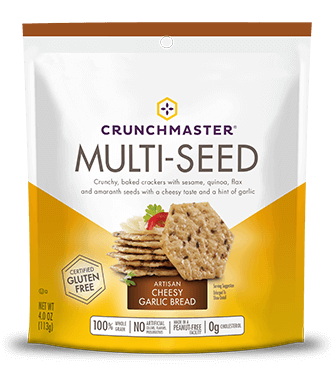 Our multi-seed crackers are made with the very best ingredients. Brown Rice Flour, Sesame Seeds, Potato Starch, Quinoa Seeds, Safflower Oil, Rosemary & Olive Oil Seasoning (Maltodextrin, Sea Salt, Sugar, Spices, Yeast Extract, Onion Powder, Olive Oil, Natural Flavor), Flax Seeds, Amaranth Seeds, Tamari Soy Sauce Powder (Tamari Soy Sauce (Soybeans, Salt), Maltodextrin [Corn], Salt). Contains Soy. Brown Rice Flour, Sesame Seeds, Potato Starch, Quinoa Seeds, Safflower Oil, Flax Seeds, Roasted Garlic Seasoning (Maltodextrin, Sea Salt, Dehydrated Roasted Garlic, Roasted Garlic Powder, Less than 2% Torula Yeast, Natural Flavor), Amaranth Seeds, Tamari Soy Sauce Powder (Tamari Soy Sauce (soybeans, salt), Maltodextrin [corn], Salt). Contains Soy. Brown Rice Flour, Sesame Seeds, Potato Starch, Seasoning (Whey Powder, Salt, Garlic Powder, Dextrose, Natural Flavor, Maltodextrin (corn), Onion Powder, Buttermilk Powder, Yeast Extract, Spice and Coloring (Paprika), Corn Starch-Modified, Spice, Maltodextrin (potato), Butter (Cream*, Annatto), Non-Fat Dry Milk, Cheddar Cheese Powder (Cultured Milk*, Salt, Enzymes), Sugar), Safflower Oil, Quinoa Seeds, Flax Seeds, Amaranth Seeds, Tamari Soy Sauce Powder (Tamari Soy Sauce (soybeans, salt), Maltodextrin [corn], Salt). *adds a trivial amount of cholesterol. Contains Milk, Soy.